Join Allison Moore, author of the self-help memoir, I Was I Am: How To Move Beyond Your Past To Create An Extraordinary Life, as she virtually tours the blogosphere in May on her first virtual book tour with Pump Up Your Book. Allison Tammy Moore’s own rise from being labeled a habitual offender to prominence deems her an expert on personal success. Born to teenage parents and ending up being adopted, Allison lived a life plagued with abuse, addiction and crime. With a criminal history, low self esteem and no one to guide her, Allison went to prison and developed her own method of recovery by redefining success. Through persistence and determination, this ex-offender to extraordinary woman, immediately used her past to fuel her passions, became a published author, speaker and entrepreneur. She is dedicated to help educate people to new levels of involvement in the lives of ex-inmates, victims, and their families. Often being called “Joseph”, after Joseph in the Bible, Allison is known as an over comer and inspires all she comes in contact with. Allison Moore is Co-Founder of Meet Her At The Gate, an organization devoted to assist women exiting prison. Allison is also the author or several magazine articles and her first book entitled: I Was I Am….How to Move Beyond Your Past to Create an Extraordinary Life. 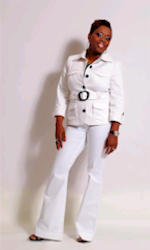 She is the wife of Quadir Moore, Founder of Meet Her At The Gate. Their work in the ministry is built upon the scripture Psalm 16:11: You have made known to me the path of life; you will fill me with joy in your presence, with eternal pleasures at your right hand. The Moore’s are honored to be the parents of three children, Kahlil, Jayda and Taahir. One of the most difficult things for ex-offenders to accomplish when they are released from prison is finding employment and becoming a productive member of society. For many, the stigma of a criminal record is just too much to overcome. For others, like Allison, it is a matter of viewing obstacles as an opportunity. “I Was I Am…How to Move beyond Your Past to Create an Extraordinary Life” (http://www.allisontmoore.com), a book by motivational speaker, author and ex-inmate Allison Moore, provides an account of her prison experience as the catalyst for change and guidelines for those who struggle with being hindered by their past. 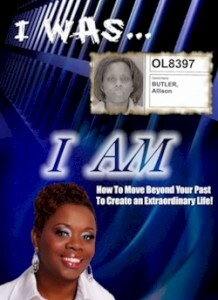 Moore wrote, “I Was I Am…How to Move beyond Your Past to Create an Extraordinary Life” (Allison T Moore Publishing, July 2010, $14.99) not just for individuals with a criminal record or who have been incarcerated, but for those who have past experiences that prevent them from living a full life. The book draws from her experiences in order to educate readers on the reality of the prison sentence, the lack of support systems and the perils of living a life unmanageable. Whether it is a physical prison experience or a prison in mental capacity, she shares her beliefs on how to become free. Her memoir is scheduled to be released on July 20, 2010. Allison Tammy Moore’s own rise from being labeled a habitual offender to prominence deems her an expert on personal success. Allison went to prison and developed her own method of recovery by redefining success. Through persistence and determination, this ex-offender to extraordinary woman, immediately used her past to fuel her passions, became a published author, speaker and entrepreneur. She is dedicated to help educate people to new levels of involvement in the lives of ex-inmates, victims, and their families “I decided to share my experiences in the hope that my book will help readers remove the limitations to being successful” she says. by numbness throughout my entire body. Barely standing, I felt as though my legs would give out at any moment. My eyes were drawn to people who were moving like actors in an old fashioned silent movie. Their lips were moving but eerie silence was all that came out. A tug on my arm brought me partially out of my fog. The cold metal chilled my wrists and my feet shuffled along with a constant clicking sound that led me out of the courtroom. Just a few hours earlier I had strutted in with confidence. Now I was being led away not so sure of myself. Now darkness and clouds of gloom surrounded me and surrounded everything in that courthouse. I should have sensed it. You know the way it smells just before a mid-summer rainstorm, how every one of your senses knows the storm is coming. Then the winds begin to blow strong and the thunder begins to roll. Well, I missed all the signs of the turbulence about to disrupt my life, and then, without delay, the roof cracked wide open right inside the Chester County Courthouse. I nodded slightly at my attorney. I knew what he was thinking. In his professional opinion, the plea offered to me for a 12-36 month was better than good. I should have accepted it when I had the chance. I gazed in disbelief at my pastor. I knew what he was thinking. In his professional opinion, the suggestion to contest the pre-sentence investigation may have been an opportunity to catch the prosecution off guard. I was confused. I asked myself, “What did just happen?” I had no answer. Faith-the substance of things hoped for; the evidence of things not yet seen. Over and over a voice echoed in my head. Faith was what I had done; at least that is what I thought. Practice makes perfect right? I confessed and believed, prayed and stood. Faith told me that my parking spot right out front was only available because Faith was giving me easy access to quickly leave the High Street court and have my Trailblazer on Route 202 in 2.5 seconds. Then this would be all over. Faith said to refuse to prepare for the worst and hope for the best. Faith assured me that those who trust in the Lord will never be put to shame, but in that horrible moment, I managed to find the irony of that statement funny. Shame is what was crushing me. Faith was dead wrong. My kids expected me to be waiting for them when they got in from school. My new boyfriend was at work expecting a text from me once I got out. USAir was expecting me to check in at curbside in approximately 24 hours, and a group of anxious trainees were expecting me, one of the companies top producing managers, to arrive for a week long training designed to increase sales at their Raleigh Durham location. Rent was due in 9 days and for once in my life it was going to be on time. The $5000 increase could not have come at a better time. What about my friends? All the people I had to call and share my miracle with? A series of events occurring over the past year, since my offense, altered my life’s direction. Didn’t that count for anything? The voice in my head got louder and more dominant. “It’s too late……it didn’t work!” My faith was shattered immediately. Without it, where was I going? I thought I was going home. I wasn’t. Where I was, was in the basement if the courthouse, where my heels clicked distinctly against the cement floor. Cold, damp and stuffy best described the atmosphere. By this time my crisply pressed white blouse was wrinkled and stained with MAC. It was hard to wipe tears with handcuffs on. Placed in a holding cell, I curled up on the little wooden bench and stared at all the carvings. I can remember thinking….”why would anyone want people in lock up to know TAE WUZ HERE?” I could hear conversations outside the steel doors but I was unable to see through the tinted two way glass. No longer able to contain my cry to my eyes, I allowed my sniffles and whimper to convert to a full breakdown. “Why didn’t it work?” If faith was here I would probably need to be restrained to prevent myself from choking her to death.